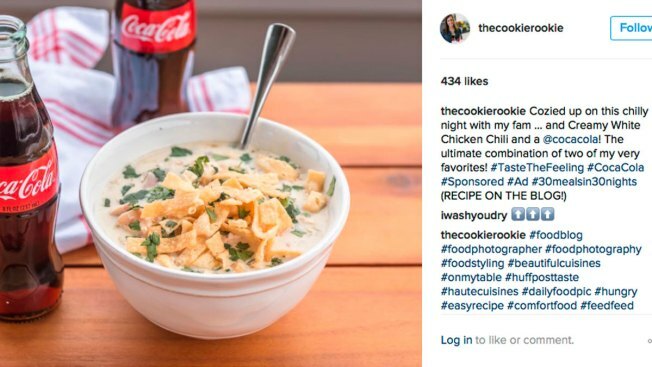 This image provided by Vox Media shows a social media post featuring a bottle of Coca-Cola next to a bowl of chicken chili. Coca-Cola is trying to sell more of its flagship beverage by suggesting the cola can accompany a wide range of meals, rather than just the fast food and pizza with which it’s a mainstay. What beverage goes best with lobster rolls, a bagel sandwich stuffed with whitefish, or a bowl of ramen? Coke wants you to think of soda. Coca-Cola is trying to sell more of its flagship beverage by suggesting the cola can accompany a wide range of meals, rather than just the fast food and pizza with which it's a mainstay. It's why a recent TV ad featured a young couple grabbling mini-Cokes while making paella, and why food bloggers were paid to post photos on Instagram of various dishes, paired specifically with glass bottles of Coke that might appeal to the aesthetic of "foodie" culture. One photo showed a bowl of chicken chili with the soda. "The ultimate combination of two of my very favorites!" wrote the blogger, who has more than 53,000 followers. The caption disclosed that the post, which got about 430 "likes," was a sponsored ad. Although Coke has often been marketed as a good companion for food, the company is trying to make sure it isn't left behind as American tastes evolve and people move away from traditional sodas. The world's biggest beverage maker is particularly trying to update the drink's image among people in their 20s and 30s who may associate soda mainly with places like McDonald's and Domino's. "It's an Amateur Move to Limit Coca-Cola to Fast-Food," stated an online ad paid for by Coke on Vox Media sites. The post, which was designed to read like a news story, talked about famous food pairings and how tastes like Coca-Cola "go with everything." A digital video series with Univision also showed people enjoying Cokes with a variety of meals, including sushi. An internal briefing about the campaign with Vox Media's creative division, obtained by The Associated Press, said Coke "has long been associated with hamburgers, hot dogs and other classic American dishes," but that the focus of the push was "sharing Coca-Cola with family over a healthy home-cooked meal." The briefing said the paid "influencers" who posted on social media should show dishes that are not "grossly unhealthy or over-indulgent." Influencers submitted ideas for recipes and photos for approval. Among the pictures with Coke that made the cut: a poppyseed and chicken salad, steak with salsa verde and an herb-roasted chicken. The push comes as Coke faces growing competition in the beverage aisle, as well as criticism over its marketing of sugary drinks. U.S. sales volume for regular Coke is down 14 percent over the past decade, according to the industry tracker Beverage Digest, while Diet Coke's volume is down 29 percent. In another company development, Coca-Cola announced Friday that its CEO since 2008, Muhtar Kent, would step down on May 1 and be succeeded by its President and Chief Operating Officer James Quincey, CNBC reported. Kent will remain chairman. To Wall Street, the Atlanta-based company emphasizes its array of beverages and investments in options like bottled teas that have bigger growth potential. And to public health advocates, the company has pledged it will market alternatives that would help reduce the number of calories people drink. At the same time, Coca-Cola is trying to shore up its flagship brand in the U.S. The strategy has been to reposition Coke as a more premium drink with packaging like mini-cans and glass bottles. That dovetails with the company's efforts to hitch the cola to a foodie culture that prizes photogenic qualities. Stuart Kronauge, senior vice president of marketing for Coca-Cola North America, said the association between Coke and hamburgers and pizza is largely a result of where the drinks have traditionally been sold. She said the recent campaign is a way to update the company's marketing, specifically among millennials, that says Coke goes well with food. "We just want to make sure that we expand the sense of it," she said. Kronauge also noted that the ad campaign incorporated Coke Zero, which is made with artificial sweeteners, and Coke Life, which is made with stevia. Although Coca-Cola is shifting into marketing for the holidays, Kronauge said the company plans to return to the theme of Coke pairing well with different foods. Ali Dibadj, a Bernstein analyst, said Coke's association with foods like burgers and fries contributes to the drink's unhealthy image. "If they can break those bounds down and match it up with a Caesar salad or quinoa salad, maybe it breaks down the mental barrier," Dibadj said. People associate Coke with pizza and burgers because those pairings are now part of U.S. culture, but also because they actually go well together, said John Fischer, a professor of wine, beverage and hospitality at the Culinary Institute of America. He disagrees with the premise that Coke goes well "with everything," as the Coke ad contends. "Coke is a fairly powerful flavor — it could obliterate more delicate flavors," Fischer said. Still, Fischer said people who don't have established ideas about food and drink pairings might try out Coke's claim and grow accustomed to having it with different foods. In that sense, he said, the company might try to "say it until it's true."